Yes, and I couldn’t help but notice that Thilo Sarrazin’s erm… Mindbelch of 2010 has a somewhat antiquated feel about it. There is just one speech about the poor and needy that gets recycled generation after generation. For example the Times on the Irish Famine: “The Irish peasant has tasted of famine and found that it was good”, hoping to get free manna from the sky. Moreover, the religion of the peasants holds that “Man shall not labour by the sweat of his brow”. We have re-entered some unbelievably dark times. Right – the similarity of the arguments going back in time is striking. I suddenly got a feeling today that we really haven’t moved very far at all in several hundred years. BTW, Sarrazin was supposed to be on the left, wasn’t he? I agree – Dickens would definitely be turning in his grave – and he would be surprised to recognise exactly the same arguments being trotted out now by those in power as in his day. The problem is I think our ‘leaders’ have read Dickens and they know exactly what they’re doing. No problem – be my guest. 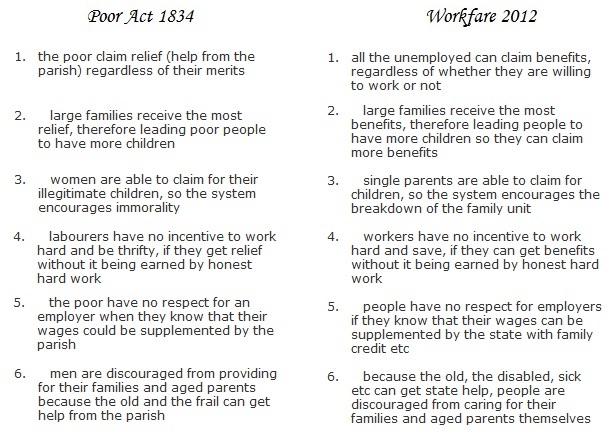 More here on the undeserving poor. When you consider the system that was operating in the feudal era it is quite good to see that they were actually very advanced in the Victorian era by comparison. However the flip side of that is the worrying fact that we are so primitive in the modern era.